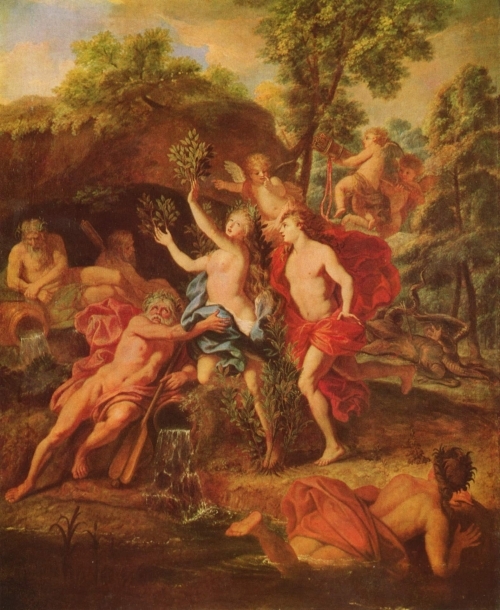 Daphne was a Greek dryad, or tree spirit, and daughter of Peneus, the river god. According to mythology, Apollo, the god of hunting, music, and poetry, offended Eros, the god of love, by mocking his archery skills. Eros retaliated by shooting two arrows: one hit Apollo and filled him with insatiable lust for Daphne, the other hit Daphne and filled her with abhorrence for all things romantic. Apollo pursued Daphne and when she was tired of running she called for help to her father, who turned her into a laurel tree. Apollo adorned himself with laurel leaves and called it his special symbol, which explains why the laurel tree is associated with the god Apollo in Greek myth.